« Single Chinese men cannot find enough women: A prelude to Revelation 9? 24 For false christs and false prophets will rise and show great signs and wonders to deceive, if possible, even the elect. 25 See, I have told you beforehand. (Matthew 24:24-25; cf. 2 Thessalonians 2:9-12). Pope Francis is a big promoter of Mary as well as the apparition in Fatima. He consecrated his pontificate to ‘Mary and even further had his pontificate consecrated to the Lady of Fatima (Pope Francis’ pontificate consecrated to ‘Lady of Fatima’). Thérèse of Lisieux is popularly known as “The Little Flower of Jesus” or “The Little Flower.” She was declared a Catholic saint in 1925 and ‘doctor of the church’ in 1997. She claimed to be healed of an illness after gazing a statute that was supposed to be ‘Mary.’ She reported on 13 May 1883 that she had seen the Virgin smile at her (Wikipedia). I have reported about her in the past (see The Catholic Therese of Lisieux) and her remains have been viewed by millions. The ‘Marian’ connection between Thérèse of Lisieux and Pope Francis is of interest. 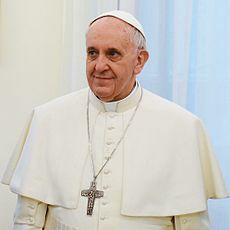 Pope Francis remains a ‘person of interest’ as far as either being the final Antichrist who will end up betraying the Church of Rome or at least setting the stage for the one who will be. This entry was posted on Sunday, September 29th, 2013 at 12:02 am	and is filed under Religious News.